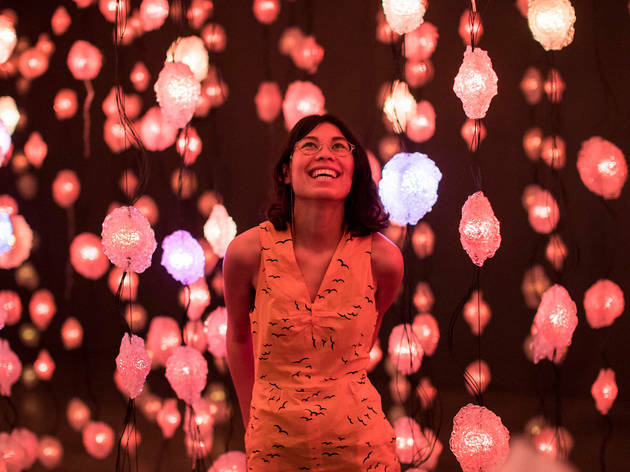 For their blockbuster summer show, the Museum of Contemporary Art have given over their third floor to Swiss video and installation artist Pipilotti Rist, for the immersive exhibition Sip My Ocean, curated by Natasha Bullock. To spend time in Sip My Ocean is to forget the institution around you, and to enter a wonderland of supersized nature and vivid colour, in which inanimate surfaces are transmogrified by projections. A sofa becomes an ocean swell; a wall becomes a horizon; a ceiling becomes the surface of a pond. You feel your frequency adjusting downwards, your shoulders relaxing, your face forming a smile. Simple things like the artist's invitation to sit (or even lie down) and look up at giant visuals, immediately put one in a childlike position; openness is almost an automatic response. One suspects that Rist would be quite happy for viewers to encounter the exhibition in a similarly childlike state of ignorance – to take the works as they find them, on face value. But if you want to dig deeper, here's our guide to five must-see works in Sip My Ocean. One of the first works you encounter, this two-channel ‘wall video’ seduces you with kaleidoscopic images of an underwater coralscape and bikini-clad female figures, to the sounds of a dreamy cover of Chris Isaak’s ‘Wicked Game’ – before you twig to the lyrics about obsessive, ambivalent love (the piece climaxes with Pipi repeatedly screaming “I don’t want to fall in love”). Curator Natasha Bullock describes it as an “impossible lullaby”. ‘Sip My Ocean’ is one of the first works where Rist broke out of the monitor and onto the walls – a transition that was enabled by changes in technology and the affordability of equipment. This two-channel video became infamous after Beyoncé borrowed many of its elements for her ‘Hold Up’ videoclip. In the first channel (or screen), a woman in a blue dress and sparkling red heels walks down the footpath of a suburban street carrying what looks like a long-stemmed flower, to the sound of a lazy electronic soundtrack by Anders Guggisberg – and begins smashing the passenger-seat windows of the cars as she passes them (at which point you realise it’s a metal replica of a flower). In the directly adjacent screen, we see close-ups of real-life flowers swaying gently in the breeze. This whole-room installation imagines a television exploding into space – via 3000 cast plastic ‘labias’, each enclosing an LED light, suspended in strands from the ceiling. Each LED operates according to its own signal, and if you were able to stand far enough away you could see a supersized image formed by all the pixels. MCA's exhibition is the first time for which the installation has been shown without another work, or projection, behind it – so viewers are experiencing it in its ideal state. The MCA have also worked with Rist to sync up the light patterns of ‘Pixelwald’ with the soundtrack to the videos ‘Ever is Over All’ and ‘Sip My Ocean’, showing in the room next door; when the female figure in ‘Ever is Over All’ smashes the car windows, the whole room of LED lights shudders simultaneously. In this room installation, visitors walk through veils of fabric in this work projected with images of the Swiss landscape, sheep, a man. Rist has talked about the strips of fabric as operating like memories: “one memory folds into another; there’s slippages in how you remember,” Bullock explains. 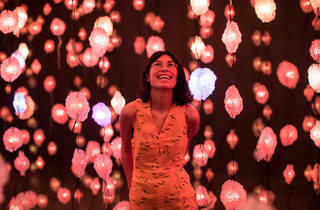 Pipilotti Rist: Sip My Ocean is on at the Museum of Contemporary Art until Feb 18. Check out their pop-up Colour Fields bar while you're there. Check out our hit list of the best art to see in Sydney this month.